I just wanted to say thank you for offering to help carry my little orangey/pink suitcase. It really meant a lot because I was having a really terrible day. Your drawings are beautiful. You are so talented. this is spellbinding! i LOVE the fingerprints in the hair! too beautiful! your work has such a serene feel to it. Thanks for posting these and GREAT artwork! you are amazing! Love this blog. Love this half-girl thumbprinted small orangey-pink suitcase drawing especially much. Your stuff is wonderful. Is it ok if I feature it on my gift blog? you make me smile. this is an awesome artwork you have here. I would like to commission a piece of work for my personal collection. Do let me know how I could reach you? you've got beautiful artwork! and the missed connections... what a great idea! I never even knew there was such a thing :) thanks! impossibly delicate. you've made something intangible, memorable. all this from your ethereal smile..
me;asian, buddy holly-esque specs, white repetto-type flats..wanting to share a friendly hip check with you. His friend saw it and we've been connecting every since. both our birthdays are coming up..you think you could share your talents with us and create a little soemthing something? I got directed her through the drawn.ca website. Really interesting work. I love your drawings! I've been down in a slump of sorts as to what to draw and what not... and your blog inspired me to do something similar. I live in LA so I figured there's some pretty interesting stories there too. I'll mention your site in my blog to give you credit and so that other people can see your work too. Thanks. I've discovered you in someone's tumblr. Thanks, tumblr. what an adorable site. i'm so glad i found it. your artwork is beautiful and uplifting. Sophie Blackall, ou make the world a lovelier place to live in. just saw your blog - i like it a lot ! Looking forward to your posts . I love your illustrations. This is a really cool project. Missed connections plus illustration is pretty much awesome. I love your work it inspires me to work in my own sketch book. I enjoy the idea of people a lot and you do a great job portraying that. Sophie your work is amazing! Touching, personal, and beautiful. Thanks so much for sharing. I hope you get the opportunity to exhibit or publish this collection. Somebody get this guy a publisher... This is too cool. Congratulations on the NYTimes feature. That's how I found you. Such evocative work. You are in my google reader now--I'm looking forward to continued Missed Connections. Wonderful stuff!! It would be great if you put a follow button on this blog. I am so glad I stumbled across your site this morning. 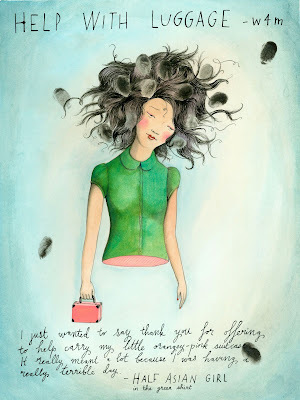 Wonderful illustrations, what a sweet way to breathe life into a few tiny words in an ad. I have learned about your work through a NYT article. Our company deals with turning beautiful and original art—just like yours—into applications for iPhone and iPod Touch for all users of these devices to be able to enjoy cool and original art “on the go”. I would like to develop applications with your illustrations to spread and market them through the iTunes APP Store. Our work plan is very simple and practical: we are responsible for developing the application with your illustrations (we could even include texts to complement your work, as well as photos, videos and accesses to your blog, youtube, etc.). Thank you very much for your time and I will be expecting hearing from you. What is the original size of this print? And is it just watercolor with ink? Beautiful! do you do specific drawings?? Congrats on your blog and project!! Missing connections are so beautiful and illustrating them makes it twice beautiful...the way you do it: three times beautiful!!! Best illustration project I've ever seen!!! I love that billowy hair and the green of her dress! She almost appears to be floating or emerging from some type of cloudy abyss. So clever and so damn cool! This is so lovely. Thank you so much. Ha! What a genius idea, with such beautiful execution! You are endlessly lovely Sophie. Your blog is wonderful, i like this type stuff. missed connections is the nice concept foe stuff.